Trump Calls For U.K.'s Nigel Farage To Be Ambassador To The U.S.
U.K. Independence Party leader Nigel Farage said he was surprised and flattered by U.S. President-elect Donald Trump's endorsement and said his critics were out of touch. In a break with diplomatic protocol, U.S. President-elect Donald Trump has recommended that pro-Brexit politician Nigel Farage become the United Kingdom's ambassador in Washington, D.C. In a tweet Monday night, Trump said: "Many people would like to see @Nigel_Farage represent Great Britain as their Ambassador to the United States. He would do a great job!" The U.K. prime minister's office rejected the idea, pointing out that it already has an ambassador to the U.S., Sir Kim Darroch. "There is no vacancy," a Downing Street spokesman said dryly. The choice of ambassador is up to Prime Minister Theresa May. To have a foreign leader publicly lobby for his or her choice is extremely rare. BBC Radio London talk show host Vanessa Feltz likened Trump's recommendation to a father telling his unmarried daughter whom she should marry. "It's not considered diplomatically appropriate," Feltz said on air Tuesday morning. "It's not good manners to say, 'Hey, you'll be sending us an ambassador and we want that guy, Farage.' It's like saying, 'You know, when you buy me a Christmas present, I want a pair of shoes from Gucci.' "
Tim Farron, leader of the Liberal Democrats, tweeted that appointing Farage was a "frankly stupid idea. I have more diplomacy in my little finger." Farage, who heads the nationalist U.K. Independence Party, said he was surprised and flattered by the endorsement and that his critics were out of touch. "I have known several of the Trump team for years and I am in a good position with the President-elect's support to help," Farage tweeted. "The world has changed. It's time that Downing Street did too." 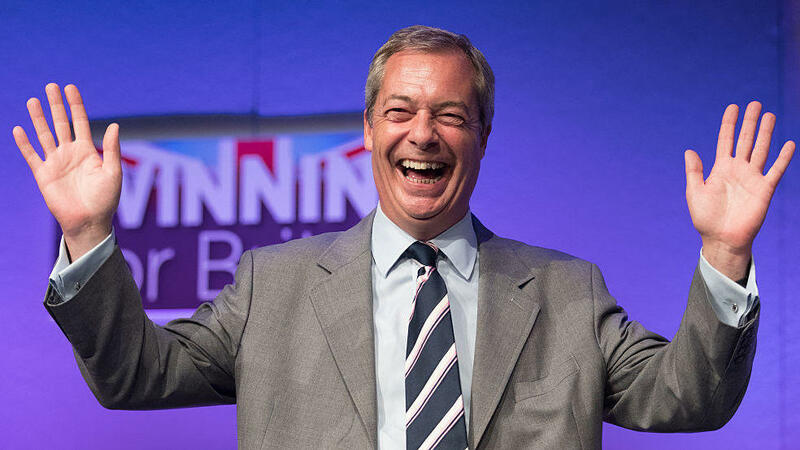 In endorsing Farage, Trump is promoting a key architect of last June's Brexit referendum, which was widely seen as vote against immigration and globalization and for a white, British identity. Trump supported the U.K.'s decision to leave the European Union and during his presidential campaign called himself "Mr. Brexit." Farage, who campaigned with Trump in the U.S., met with the president-elect in New York just after this month's presidential victory. Andy Wigmore, a media consultant and Brexit campaigner who attended the meeting, told the Express newspaper that Trump repeatedly criticized wind farms in Scotland and urged him to campaign against them. "He is a complete Anglophile and also absolutely adores Scotland, which he thinks is one of the most beautiful places on Earth," Wigmore told the Express. "But he is dismayed that his beloved Scotland has become over-run with ugly wind farms which he believes are a blight on the stunning landscape." Trump met with journalists and executives from The New York Times on Tuesday. Times correspondent Maggie Haberman tweeted that Trump said he "might have" brought up the wind farm issue with Farage. Trump owns a golf course in Aberdeenshire in Scotland and bitterly fought plans to build a wind farm nearby, taking his case to the U.K.'s highest court without success. In 2012, Trump told a Scottish Parliament committee that wind farms would ruin tourism. In a text exchange with NPR, Wigmore said the conversation with Trump was a general one and that he agreed with the president-elect's wind farm position. "It's not about the issue of wind power more about how they look and when you have the most stunning scenery in Scotland or in England then these wind farms should be put in areas that do not disrupt the natural beauty," Wigmore wrote. Wigmore served as campaign director for the Brexit group, Leave.eu. He said polling shows strong opposition to wind farms among the group's million supporters. "So what Trump said played perfectly to what we were already aware of," Wigmore wrote. Trump and his family have drawn criticism for not drawing a clear line between their extensive business interests and his role as president. Since the election, Trump has met with business partners from India. His daughter, Ivanka, an executive with the Trump Organization, also sat in on a meeting with Japanese Prime Minister Shinzo Abe. Contacted by The New York Times about the exchange with Farage's group, Hope Hicks, a spokeswoman for Trump's transition office, initially denied that the president-elect had brought up wind farms. When pressed on Wigmore's detailed recollection, however, she declined further comment. Trump has dismissed criticism about blurring the lines between his business interests and job as president. In a tweet, he wrote, "Prior to the election it was well known that I have interests in properties all over the world. Only the crooked media makes this a big deal!" When asked if he felt he was talking to a businessman or the president-elect, Wigmore wrote: "Both — the man is a doer — which is the businessman in him — he gets things done — he knows he is the President Elect but you will remember he felt Washington and [the] bureaucracy stopped things from happening — he knows that he can make things happen doing things his way."